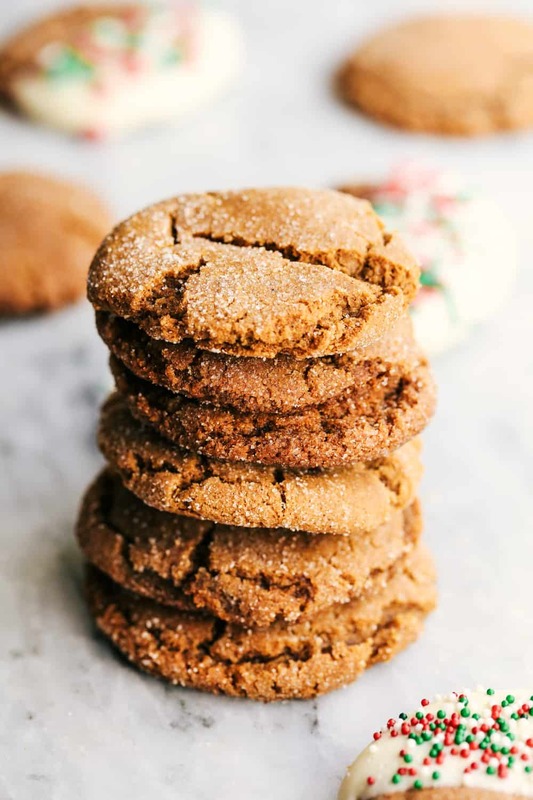 Best Ever Molasses Cookies have a slightly crisp sugar coated edge and a soft and chewy center. 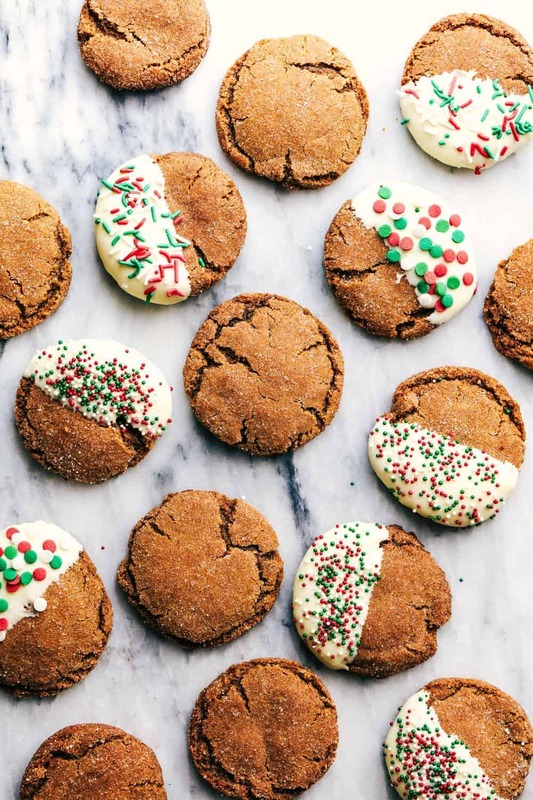 These are the perfect holiday cookie! We recently had a cookie contest and asked you all to submit your favorite holiday cookie. It was so fun going through all of the submissions but this one caught my eye. 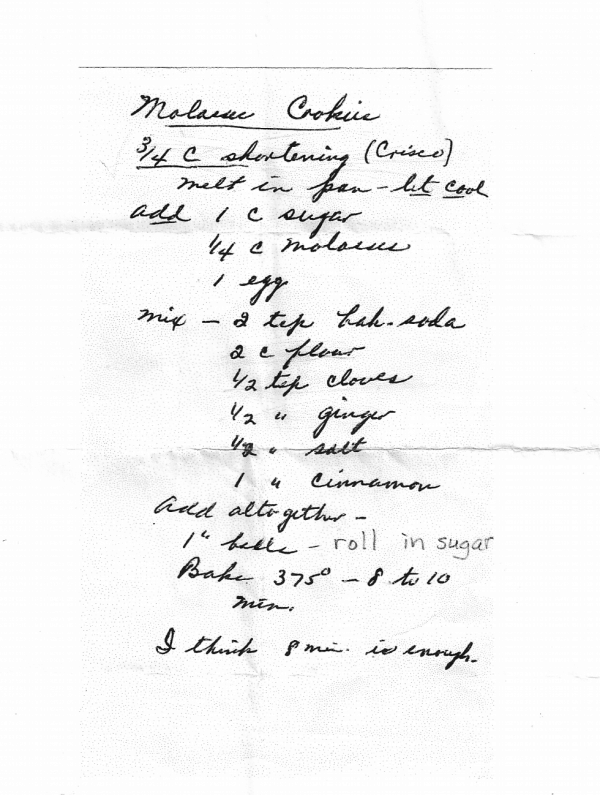 It was a handwritten recipe from Millie Dunn from the 1970’s for Molasses Cookies. 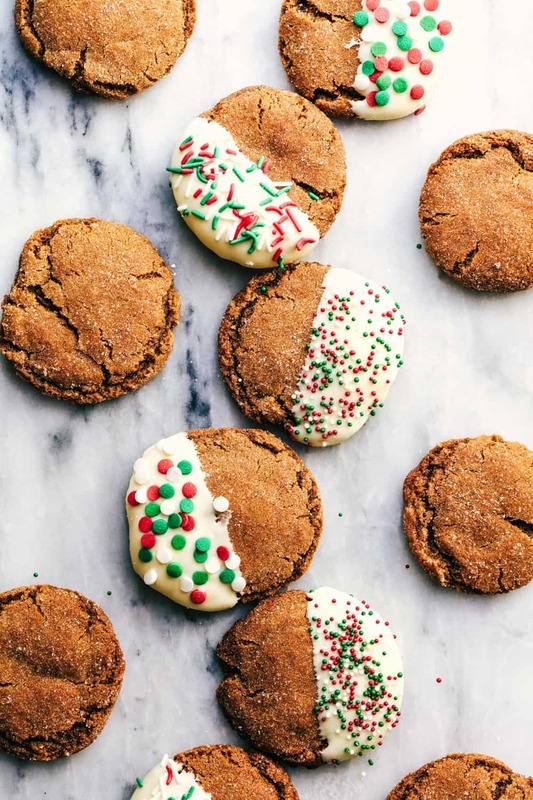 Molasses Cookies are the perfect cookie and the holiday wouldn’t be complete without them. I knew that this recipe was a winner and was submitted by her daughter, Megan from San Diego. These were a perfect molasses cookie. They had a slightly crisp edge that gets rolled in sugar and a soft and chewy inside. Not only did I think that they were the best, my three-year-old kept sneaking them away. She absolutely loved these cookies! I even found one in her bed in the morning when I woke her up. The whole family ate the entire first batch. I had no choice but to make another batch. These cookies are perfect as they are but I decided to make them more festive. We dipped them in white chocolate and added Christmas sprinkles. They turned out so amazing! These cookies are such a classic. They make the perfect Christmas cookie and are the perfect addition to that Christmas cookie plate! I know that your family will love this recipe just as much as we did! Preheat oven to 375 degrees. Line a baking sheet with parchment paper or use cooking spray. Melt the shortening in a small saucepan or in the microwave and let cool. Add the sugar, molasses, and egg and mix until incorporated. In a medium-sized mixing bowl, add the flour, baking soda, cinnamon, ginger, cloves, and salt. Add this to the wet mixture and mix until it forms a dough and is incorporated. Scoop into one inch balls and roll in sugar and place 2 inches apart. Bake for 8-10 minutes. Let cool on a wire rack and dip in white chocolate if desired. If dipping in chocolate: melt the chocolate in a microwave-safe bowl stirring after 30 seconds until melted. After rolling in to one inch balls you do not flatten them out? I agree, these are “best ever,” and they are super easy to put together. I chilled my dough for an hour and baked the cookies at 350 degrees because 375 caused the bottoms to darken. I didn’t flatten my dough balls at all, and they spend out perfectly. Thanks for an excellent recipe. You were not kidding! 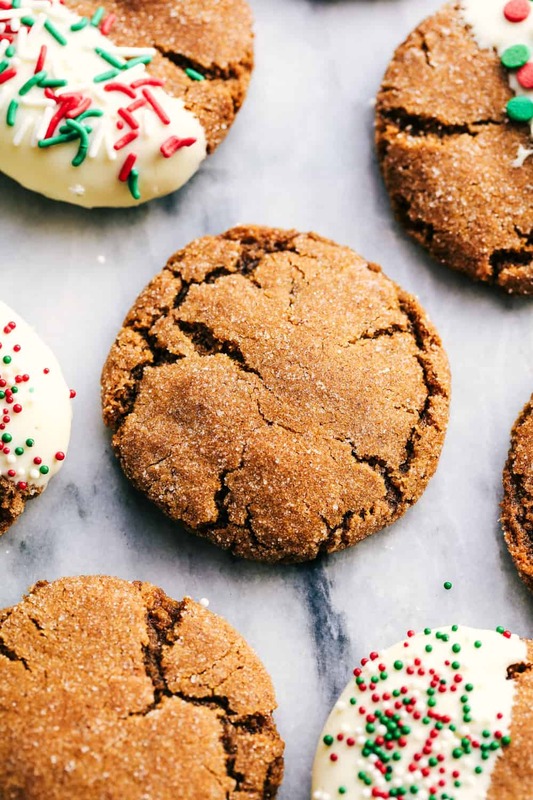 Your “Best Ever Molasses Cookie” are so delicious. Truley the best I’ve ever made. They are light, crunchy & full of flavor with the perfect amount of molasses flavor. I’m so happy I tried this recipe it’s a keeper & that I found your wonderful site. Best cookies ever!!! I have made these 3 times in 2 weeks, they have become my husbands favorites. I’ve been making this recipe for more than 50 years. It’s from the back of the Brer Rabbit molassess bottle. I prefer to use butter though. No, you do not need to flatten the balls. You can add 1 teaspoon of white pepper to add a little zing. The cookies are perfect for Christmas! Thank you for sharing the recipe! 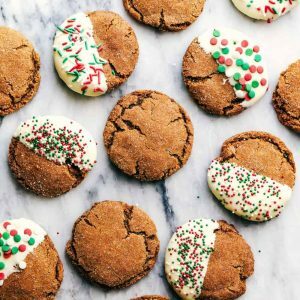 Hi, a question on those “best ever molasses cookies”…would they work with butter rather than shortning? I know my mom always used crisco, but most of my recipes today ise butter. Any thoughts? I was planning on making the dough balls a day or two in advance and freezing them… do I roll the balls in sugar right after making the dough, and then freeze? Or should I keep the dough balls naked upon freezing and roll in sugar right before baking? Thank you so much!! You will wait to add the sugar until before they are going in the oven. These cookies are amazing! The whole family loved them. I’m really excited about trying this recipe. I made this yesterday and the cookies reminded of the ones my mom made when I was little. Thank you for this recipe, Alyssa, and Merry Christmas! I wish you and your family all the best!